America’s first National Park, Yellowstone, did not disappoint! We had only been there once before and just for a day, so we didn’t get to experience the fully majesty of this park. We decided to stay on the northern side of the park in Gardiner and avoid the touristy and crowded West Yellowstone area. The town actually ended up being bigger than we anticipated with plenty of restaurants and services for our stay at the Riverside Cottages. Both the cottages and the town are the perfect base for an extended visit to Yellowstone. 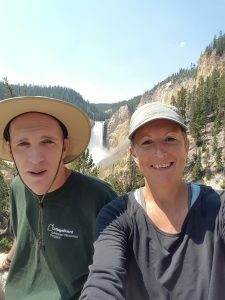 Yellowstone is a huge park, so we decided to break our visit down and focus on different sections of the park each day. Canyon Village & Tower-Roosevelt: Yellowstone Falls is located in the Canyon Village area and is a must see! There are two roads to access the falls, either the north or south rim and both have amazing views. Make sure to get there early in the day, but afternoon there was a waiting line to get a parking spot on at Artist Point on the South Rim Road. The park was doing some major construction work at the Uncle Tom’s Point and Trail so there wasn’t much hiking available on the South Rim. The North Rim has some great hikes down into the canyon to get some great views. 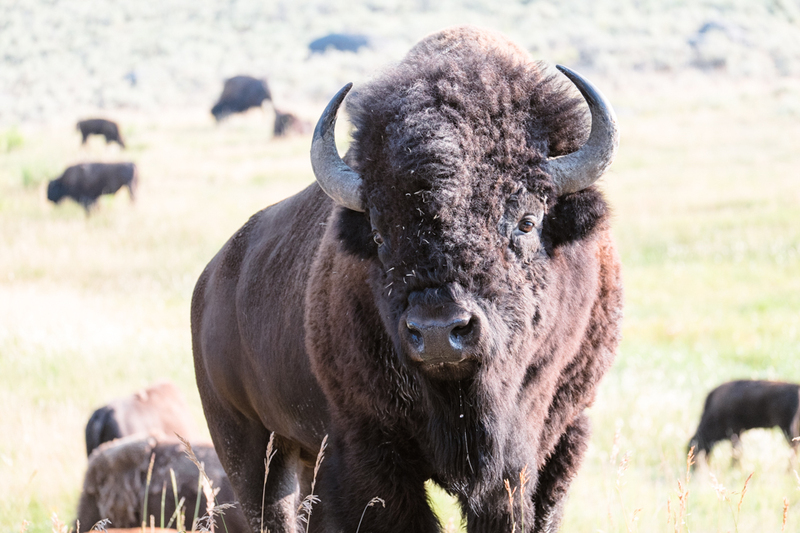 Lamar Valley: If you want to see wildlife, this is the place to go. You are almost guaranteed to see large numbers of bison in the valley and if you are lucky like we were, you might get to see wolves. We noticed there were a lot of people lined up along the road with scopes and a Yellowstone volunteer let us check out the Junction Butte Pack through her scope. The pack had killed a baby bison but the mother was still protecting it and the wolves were trying to move in. It was so amazing! Old Faithful: Obviously this is the one place everyone goes when visiting Yellowstone, so expect huge crowds. Thankfully Yellowstone provides lots of parking and services; so while this is an extremely popular spot, we never felt overwhelmed with all the people, although it never hurts to get there early, so you don’t have to waste time trying to find a parking space. Plan your visit around the Old Faithful eruption times, which you can find out at the visitor center and make sure to get to the seating area 15-30 minutes before the eruption so you get a good seat. There are some nice boardwalks and trails in the area to see all the geysers. We had great timing and watched the Riverside Geyser erupt, which we actually thought was more impressive than Old Faithful. Yellowstone Lake: If you want to escape the crowds, Yellowstone Lake is the place to go. Located in the south side of the park, this is a much quieter side. Coming all the way from Gardiner it was a long drive, but we got to watch a coyote hunting as well as three bison swimming across the Yellowstone River. We had a nice hike to the lake and enjoyed a relaxing day here. Returning to Gardiner wasn’t as easy in the afternoon because the Hayden Valley is also a great wildlife viewing area and everyone was stopping in the road creating huge traffic jams. There is a reason Yellowstone is America’s first national park and is a must see. With 4.2 million visitors last year, it is worth planning your trip around the crowds to get the best experience. We have loved Glacier since our first visit in 2002 and three visits later we still believe it is one of the most beautiful national parks. But 15 years brings a lot of changes, especially the increase in the number of visitors. On our first visit we enjoyed many solitary moments on hikes and lots of opportunities to see wildlife, but as visitor numbers have increased those moments seem to be getting harder and harder to find. Despite this, we still had a wonderful time, staying at our favorite cabins, the Silver Wolf Chalets and revisiting our favorite hikes. Hidden Lake: One of our favorite hikes is to Hidden Lake. This hike is extremely popular because it starts at the Logan Pass Visitor Center and provides amazing views. Although it is a fairly steep hike, most of the way up is on a boardwalk. This is the most popular and crowded part, but as you descend to Hidden Lake you will find fewer and fewer people. This is a popular place for mountain goats, although the park has been experimenting with using “Gracie” a Border Collie, to herd wildlife away from popular tourist areas. St. Mary & Virginia Falls: We have done this hike on every visit but a wildfire in 2015 has made this hike a little different. Instead of hiking through a forest, we were hiking much more out in the open, which is great if you are trying to keep your eyes for bears! We decided to extend this hike by starting at Sun Point and hike along St. Mark Lake and which also allowed us to visit Barre Falls. 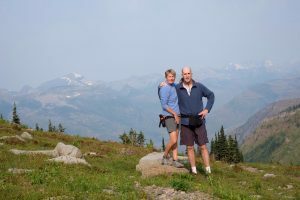 Highline Trail: This trail has gotten much more popular and also begins at the Logan Pass Visitor Center. This is an amazing hike with not much elevation gain. You can hike as far as you want and then turn around, or do the full 12 mile hike which is strenuous and has a steep descent at the “Loop.” You will need to either take a shuttle or arrange for transportation as this is not a loop trail. We hiked about 3.5 miles to Haystack Butte and then turned around. If you plan to do anything in the Logan Pass get there early! The parking lot fills up by 8:30am , which used to be around 11:30am, and we witnessed one fight over a parking space when we were leaving. With the increase in visitors we noticed quite a strain on visitor services. 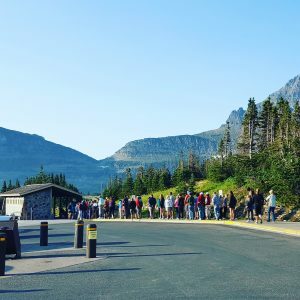 Although the park has been trying to keep up with the increase in popularity with a shuttle service and a new visitor center and parking area in Apgar Village, Logan Pass is one of the most popular areas in the park and the capacity to handle those visitors has not increased. Avalanche Lake: This is a popular hike in the Lake McDonald area, another place to get there early to ensure a parking space; by the afternoon cars are parked along the road. This is a nice hike along Avalanche Creek and through the woods to Avalanche Lake. You can continue to follow the trail all the way to the other end of the lake. 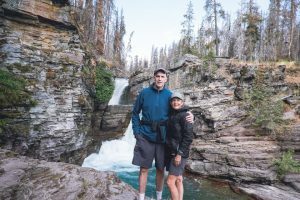 Piegan Pass: If you want to escape the crowds try some of the less popular trails like Piegan Pass or head over to the Many Glacier side of the park. Although this trail has a 1700′ elevation gain, it’s a steady climb through the forest to amazing views. It’s worth following the trail over the pass for amazing views of the Many Glacier area. Glacier has had a 27% increase in visitors just from last year. With amazing views and wildlife viewing you can see why this park has becoming increasingly more popular. 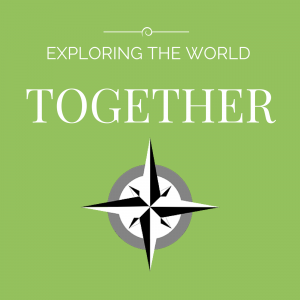 Many parks are starting to do extensive studies on not only the environmental impact of these visitor increases but also how to improve visitor experiences. With decreased federal funding and staffing cuts, this puts an even heavier burden on the National Park Service that they might not be able to manage.